Our History began in 1870’s when the spiritual leadership of the Catholics in the Portland area was in the care of the Bishop of Detroit. Pastoral assistance was given by priests from the neighboring parishes of Ionia, Miriam and Pewamo. Frs. Grimme, Fenner, Ryan, Holten are notably remembered. In 1899 Fr. Mathias Auer became the parish’s first official pastor and today Fr. Mike Alber serves as the parish’s sixteenth pastor. Fr. Charlie Hall oversaw the construction of the final addition to the school to complete the building as it stands today. This was completed just a few years before the 2006 school centennial. Through the years, St. Patrick Parish gave to the church priests and nuns, namely: Msgr. Herman Zerfas, Frs. Jacob Gensterblum, Larry Hartwig, Michael Fedewa, Dan Cook, John Vallier, and Carl Pung. St. Patrick alumni Mike Steffes and John Johnson are currently discerning the priesthood. 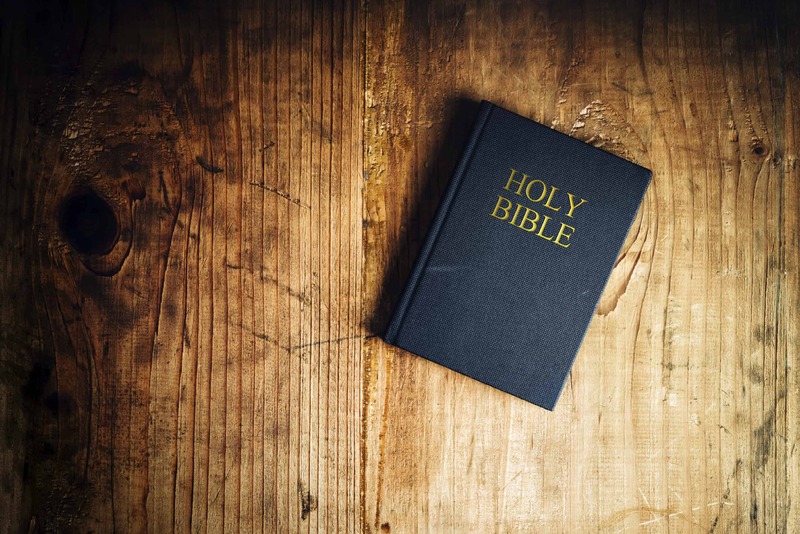 Additionally, several young ladies joined the Sisters of St. Joseph and other religious congregations and served as teachers, nurses, and social workers. As of 2015, the parishioners numbered 1130 families and over 330 students were attending St. Patrick School with another over 220 enrolled in religious education. Fr. Charlie Hall inherited the renovation project begun by Fr. Reginato and presided over the 1999 Parish Centennial. In 2001 Fr. Hall oversaw the building of a new addition to the school completing the school as it stands today. Fr. Larry King is the current pastor of St. Patrick Parish and in his time Fr. King has presided over the 2006 school centennial, bought several buildings and plots of land for future expansion, and started and continued numerous programs in and around the parish. Fr. 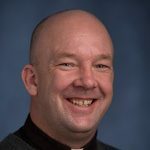 Mike Alber was ordained a deacon in 2001, ordained a priest 2002 and his first assignment was as the pastor of St. Michael, Brunswick, and Christ the King, Hesperia. 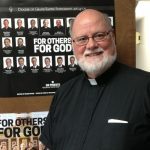 He was the Pastor of St. John Vianney in Wyoming from 2008-2018. He began his Pastoral duties with St. Patrick February 1, 2018. Fr. Julian Reginato initiated a much needed renovation program of all buildings and grounds in preparation for our first centennial. Additional properties were purchased for future expansion. The convent became identified as the “Annex” and used as a center for out newly formed religious education program designed to administer all religious educational needs of parishioners, both youth and adult. Fr. Charles Hall assumed the responsibilities of pastor in late June 1997 and ensured the completion of the renovation of the interior of the church in September 1997. Fr. 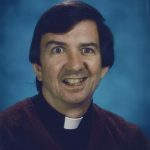 Richard VenLente served as pastor for much of the 1980s during which he started the Fr. Flohe Foundation. The foundation helps fund the school and offers scholarships and is still in use today. Fr. Julian Reginato was St. Patrick’s Pastor for seven years and began the renovation of many of the parish buildings in preparation for the parish’s centennial in 1999. A new rectory was constructed by Fr. Joseph Malewitz on the corner of Church and Center Streets. The old rectory on Grand River Avenue was demolished to make room for a shrine to our patron saint, St. Patrick. In 1976 under the administration of Fr. Donald Weber the sanctuary of the church was remodeled to meet the standards established by Vatican II. In 1988, Fr. Richard VanLente started the Fr. Flohe Foundation to fund the educational programs of the parish and ensure continuity to its school. Fr. Julius Amman was pastor at St. Patrick Parish for only two years but served during the Second Vatican Council. During Fr. Joseph Malewitz’s tenure as pastor he oversaw the building of the Parish Office building that is still in use today. Fr. Donald Weber served as St. Patrick Pastor for almost ten years during which he oversaw the remodeling of the sanctuary to meet the standards set by Vatican II. Pastor Louis Flohe purchased property on the west side of West Street and made temporary classrooms out of two barracks. In 1951 Fr. Flohe tore down the old school and built a larger one. In 1961 he completed it with an addition and the school building and for the first time offering kindergarten through twelfth grades. The temporary classrooms were joined together along Center Street and transformed into a convent. The old convent was demolished to make room for the church parking lot. Fr. Flohe, for all of his work, was rewarded with the title of “Monsignor.” In 1946 Fr. Flohe has also purchased land from Ionia County for an athletic field on Grand River Avenue and Union Street. In 1971 the Estate of Msgr. Flohe’s brother, Bert, donated $2500 to improve the field. The Knights of Columbus were instrumental in doing this work. They built the pavilion on Grove Street, now known as K of C Park, while the athletic field is now called the Fr. Flohe Field. Fr. Louis Flohe served as pastor at St. Patrick Parish for seventeen years, by far the longest of any parish pastor. Fr. Flohe served as pastor until his death in 1962. During his time as pastor Fr. Flohe made many significant improvements to the parish. In 1946 Flohe purchased the land across the street from the church from Ionia County. Today this land holds the baseball and softball fields and is known as Fr. Flohe Field. In 1951 Flohe tore down the 1906 school building and rebuilt a more modern school then in 1961 he built an addition to this school. For all this work at St. Patrick Fr. Flohe was awarded the title of Monsignor. During the pastorate of Fr. Joseph M. Rochford, St. Patrick Parish was assigned to the jurisdiction of the bishop of Lansing and in 1938 when Fr. Joseph Kohler was pastor it became part of the Diocese of Grand Rapids and remains in that diocese. Fr. Joseph Rochford became pastor after Fr. O’Rourke. In 1937, under Fr. Rochford, St Patrick Parish was transferred from the Diocese of Detroit to the fledgling Diocese of Lansing. Fr. 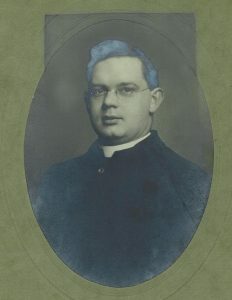 Joseph Kohler became pastor of St. Patrick while it was a part of the Diocese of Lansing but in 1938, his first year as pastor, the parish was transferred again, this time to the Diocese of Grand Rapids where it resides today. Fr. 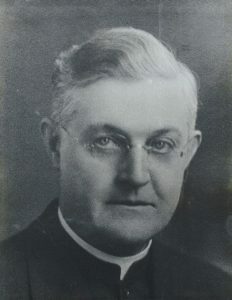 John Griffin (1920-1922), during his short time at St. Patrick Parish, held a competition to determine the architect of the new church to be built. Harry Mead was chosen but before construction could begin Fr. Griffin died at the age of 38 after an unsuccessful surgery. Fr. 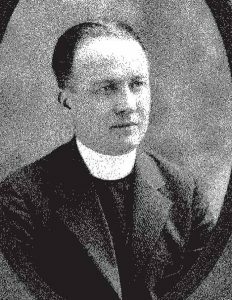 William O’Rourke (1922-1934) took over as pastor of St. Patrick and took over the in progress project to build a new church. Fr. O’Rourke disregarded Fr. Griffin’s choice of Harry Mead as architect and have the job to Henry Walsh, a brief legal battle ensued. In 1927 the church was finally completed and is still in use today. St. Patrick’s Parish soon outgrew its church building. In preparation for a larger one, Fr. Koelzer had the wooden church moved to West and Center Streets and converted it into a parish hall. In 1931 it was destroyed by fire. By 1926 the new church was built in a Gothic-Tudor style according to designs Fr. William O’Rourke had obtained from a rural church in England. Cost for the new church was $80,000. The seating capacity was approximately 550. In 1927 the pipe organ was installed, paid by church organizations at the cost of $3500. Light fixtures, altar canopy and pulpit were made of wrought iron by Fred Russman, Sr., a local blacksmith. In 1928 a bell was purchased for the new church and was dedicated in memory of Fr. H. Koenig and other founders of the Catholic community. Such names as Rose and Mary Manning, Jerry Moriarity, and Nick Lawless together with that of Fr. Koenig are inscribed on the bell. It has been preserved and is on display in the vestibule of the church. Fr. John Koelzer became the parish’s second pastor after the death of Fr. Auer. Fr. Koelzer began preparations for a new church, moving the original church and converting it to a parish hall, but he left the parish in 1920 before construction of the new church began. The Catholic community grew steadily with German families moving in from Westphalia. Fr. Mathias Auer, a German immigrant, succeeded Fr. Koenig and was named the first pastor of St. Patrick’s. Fr. Auer made Portland his “home” in life and death. The parishioners, numbering approximately 60 families, built a rectory for him. In April, 1908 Fr. Auer died and was buried in Portland Cemetery. July 14, Fr. Charles G. Bolte of Ionia was authorized by Bishop Borgess of Detroit to build a church at Portland. In the late 1870’s we hear of the Moriartys, the Millers, the Mathews, the Siebels, the Lawlesses, the Mannings, the Sondays, the Kilmartins and others. They were probably some of the original Irish settlers and they named the new church after the great apostle of Ireland. When St. Patrick’s was made a mission of St. Johns, Fr. H. C. Koenig came every other Sunday to celebrate Mass and brought many improvements to the newly built church. Frs. Grimme, Fenner, Ryan, Holten, and Koenig also helped hold mass in Portland at this time.